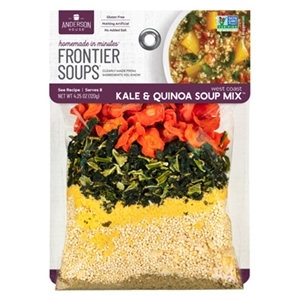 Frontier West Coast Kale & Quinoa Vegetable Soup is made with two of the super food ingredients on every list of nutritionally dense foods and are incorporated into this new mix designed to please vegetarians as well as all soup lovers. Kale and butternut squash are paired with quinoa for substance and protein in this mix. Add broth, canned tomatoes and fresh squash to complete a 30 minute preparation. Tasters are loving its bright and colorful appearance and substance in a bowl! In a 4-quart pot bring broth to a simmer on stove top. Place butternut squash in a microwave bowl, covered, and microwave on high for six minutes. Add contents of Kale and Quinoa Vegetable Soup Mix to soup pot. Stir in tomatoes and partially cooked squash, and cover soup pot. Bring back to a simmer for 25 minutes. Turn off heat and allow to stand for 25 minutes. 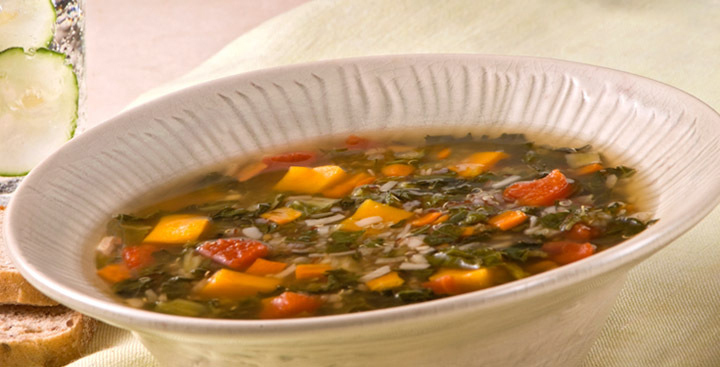 Serve this delightful whole grains and vegetable soup with crusty wheat bread. For a quinoa-based dish, use four instead of six cups broth and add 2 cups cut up cooked chicken along with the squash and tomatoes. Follow recipe as written and serve with green salad. White quinoa, kale flakes, chopped onion, butternut squash flakes, carrot, garlic, thyme, oregano, rosemary and peppercorn blend. No added salt, preservatives or MSG.